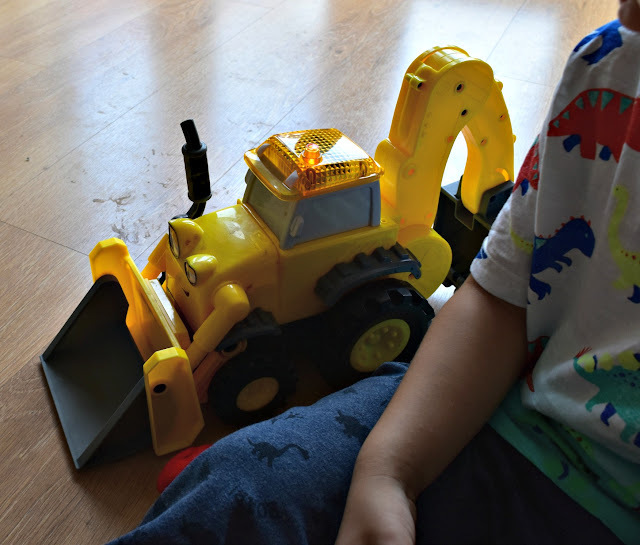 Bob the Builder has been a hit in our house for quite a while, Jack loved it when he was younger and had a range of the toys back then. They've since made there way onto new homes as they got played with less however he still enjoys to watch it. Last year Bob had a bit of a make over as did the crew, however you can still recognise him from the original character design. Fisher Price have created a range of toys to go alongside Bob's new look, and the RC Super Scoop is one of these. 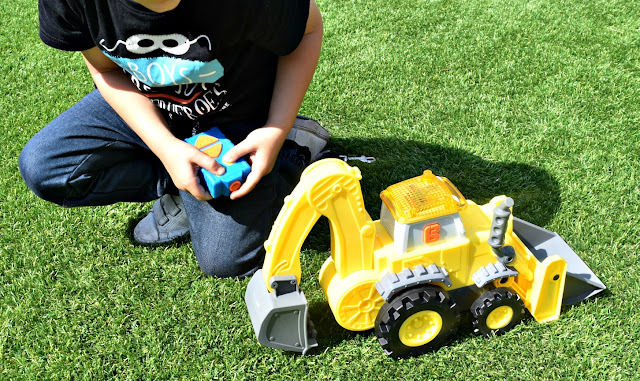 We were recently sent one along for review and Jack absolutely loved it. The RC Super Scoop is remote controlled and brings Scoop to life with many different phrases, sounds and a motorized action as well as the one-of-a-kind jaw-dropping stunt. RC Scoop can be played with in two different ways, one using the remote control and the alternative being just by pressing the button on the side. 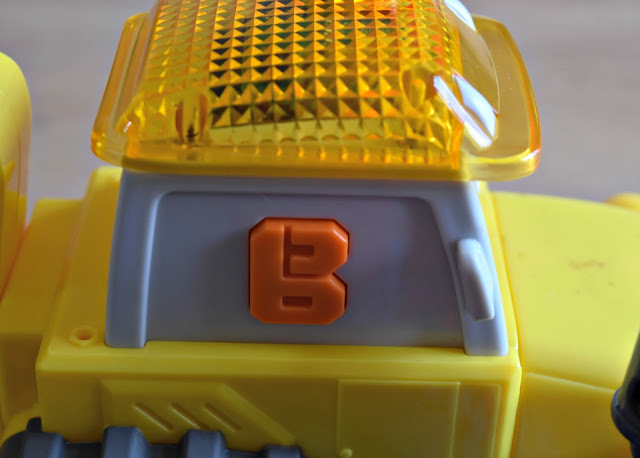 Manually playing with RC Scoop you are able to use his exhaust to lift his front bucket, and press the 'B' symbol on the side to activate fun phrases, sounds and the lights. Alongside this is also a simple controller allowing the user to control Scoop forwards and backwards and also operate the back bucket. The controller has another trick though, have you ever seen a digging machine do a handstand? Well using the controller you are able to watch Scoop perform the amazing 'Scoop Stand'. This incredible stunt allows Scoop to use his back digger to push himself up and lift his body straight in the air. To power the unit a total of 6 batteries, 4 AA in Scoop and 2 AAA in the remote. There are some demo batteries included within Scoop but the AAA will be required for the remote before use. 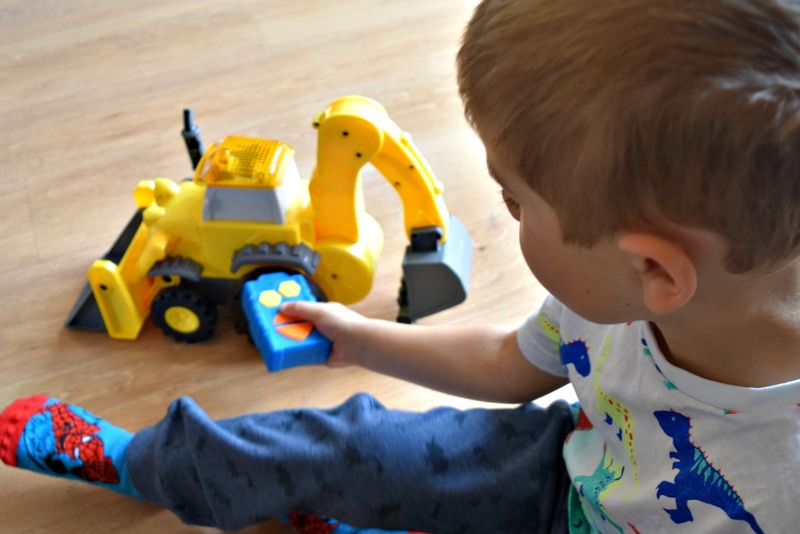 In his short life Jack has had a small range of remote control cars and I can definitely say this has been his favourtie and the one hes most enjoyed. This toy is very robust and both Isla and Jack have enjoyed playing with it, Jack properly and Isla carrying it around and so far, no breakages or anything. 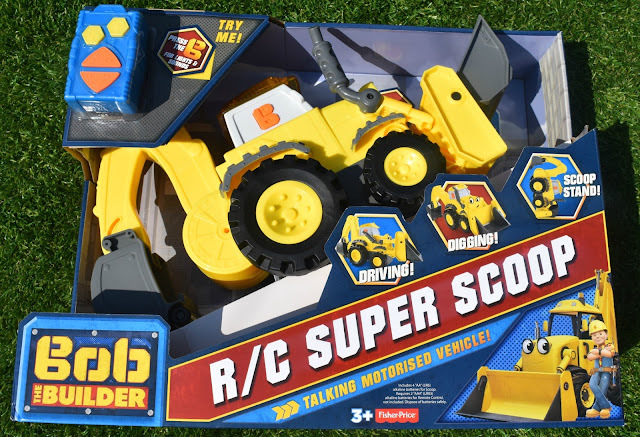 RC Super Scoop is available in all good toy shops with an RRP of £49.99. Although this may seem a little highly priced, for the quality of the toy and with it being licensed I feel this is a really reasonable price. Please Note: We received this toy in exchange for an honest and open review, all words and opinions are my own and not influenced in any way.